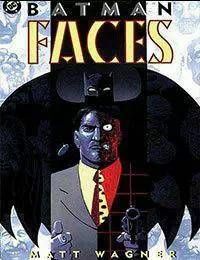 When District Attorney Harvey Dents face was forever deformed by a vial of acid, his mind was also fractured and the maniacal Two-Face was born. In BATMAN: FACES, the demented schizophrenic, enraged by his own isolation and alienation, attempts to create a country of deformed men. Taking over a small Caribbean island and forcing plastic surgeons to perform unholy operations, Two-Face begins to create an army in his own image. But when a simple blackmail investigation leads Batman to discover his former allys mad scheme, Two-Faces pursuit of power is quickly ended.